I seldom experience that simple, laid back life that most people see when they travel to Vietnam. It’s all portrayed in my work — high contrast lighting, hectic, imperfect, but full of stories. Photography to you means: A tool like other art tools to help capture and express the stories as well as the human conditions. When I frame the image: I think first of what story I want to tell. What is the message here? A camera is: Just a box that records images, nothing more than an expensive tool. I’m Francis, but my real Vietnamese name is Van Anh; Francis is a name I gave to myself as a persona to try to be an artist. Although my work is in photography, I try to include art influences into it. I don’t make snapshot images, but images made with stories and ideas behind them. Many of my images don’t look realistic, some, more like paintings. That’s the world I want to create, more colourful, more exciting, somewhat like an escape from reality. I was born and raised in Saigon, even my parents were, so I’m very much a city person. I seldom experience that simple, laid back life that most people see when they travel to Vietnam. It’s all portrayed in my work — high contrast lighting, hectic, imperfect, but full of stories. I love taking portraits and editorial fashion photos, there’s so much freedom in it to explore. I translate how you see the world in pictures. I also get to meet and work with a lot of people, get to know their lives. With portraits, few people have ever had their portraits taken. Their reaction, when I show them how I perceive them, is always interesting. It’s not a walk in the park, but giving people the experience of their portraits taken is always a thing I’d want to do. My first camera was a Canon 500D with a kit lens. I saved up a few months to get it, and it was also my first big investment. Then, I started taking photos of my friends. Most of them happened to be musicians, then it kind of clicked and I moved forward from there. How I view people and things have always been much different from others. I’ve always wanted to experiment with ideas, meet interesting people. But, I can’t draw. I don’t know how to paint and didn’t go to a proper art school like the rich kids. Photography was the fastest and most accessible way I could use to translate my ideas into art. This happens to be the medium that I got involved with in my life, and it’s been a hell of a journey. Most of all I love the process of a photo shoot. The people I meet, the things everyone comes up with by working together. I used to tell people “I feel most alive when I’m on set, the rest of the time I’m just inside my head”. Because photoshoots are where my ideas get the main playground. Where my ideas get to go out there to see the world, and that’s what I’m living for. I seldom experience that simple, laid back life that most people see when they travel to Vietnam. It’s all portrayed in my work — high contrast lighting, hectic, imperfect, but full of stories. Babes of Saigon (I’m still not very sure about the name), it’s still an ongoing project I’m trying to push. I’ve always wanted to document this “phenomenon”, a theme I want to explore further and keep taking pictures of. So, in my mind, it’s still an ongoing project and I want to share the process with others. 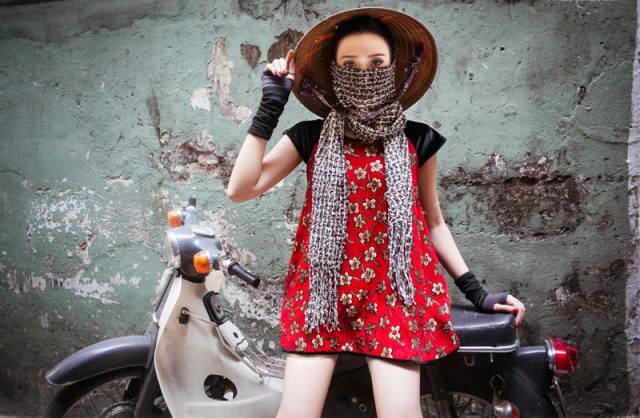 In Vietnamese culture, women don’t have to cover their faces or hair. Yet, they are always so concerned with how they look to a culture standard. Many of them would go to ridiculous lengths, no matter how silly they look, to keep their beauty ideas. For instance, cover all their skin from the sun to keep the porcelain white skin. You look at someone covered from head to toe with 10 different types of floral fabric, plus giant sunglasses. It is hard to even tell if it was a person underneath all that or not. But once they stop the bike, and they take all that hideous “aprons” out, there’s a beautiful girl underneath! It’s kind of like magic—the Vietnamese magic. Haha. I am inspired by pretty much anything that’s different from the norm. Non-conforming while telling a story at the same time. By things that are provocative, surrealistic, but not superficial and empty. I love how you can distort and transform reality only with a little black box and some glasses. That’s what I love about photography. Most of the time I’m inspired by movies and music, painterly photographs. I watch a lot of movies and always listening to music. My ultimate inspiration is the classic Blade Runner (1986). I also get inspired by David Lynch, Paolo Roversi, David Sims, Annie Leibovitz, Harley Weir, Julia Hetta and Nicolas Jaar. Female beauty especially draws a lot of my attention. There are so many different standards and stigma attached to it. That makes it an inexhaustible source for a lot of artists. My current favourite photographer to draw inspiration from is Harley Weir. I’m fascinated by city lights at night, like around 1am to 4am it is a magical time. Everything seems so still, so dead—yet so vibrant and so alive. My main obstacle would be financing and finding a stable team to work within photoshoots. Because the like-minded people I work with come and go out of Vietnam all the time. If you want the best team you gotta have the budget, but that’s not the case for personal projects like mine. I’m looking forward to collaborating with other photographers/artists alike. 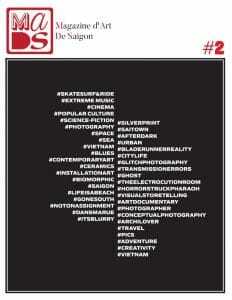 I want to do projects together, to develop Saigon’s art scene more and more. My advice: focus on your work and what you want to do most. Don’t waste time comparing yourself with others in the same field. These images were shot for Word Vietnam magazine, the Fashion issue. We shot these right in front of the Word office, utilizing the classic Vietnamese alley.